I do have one issue with this application. If you have a passcode on your iPhone, it bypasses the passcode to open the applications. Meaning, that anyone could get into your contacts, email, SMS info, Calendar info, make a phone call…basically they would be able to see a lot of your private information. If you do not normally keep a passcode on your iPhone then you probably don’t really care about this. But, for those of you who do have a passcode on your iPhone (that includes me) you might want to skip this application. Nice app. Could come in handy. Off topic question: how did you take a screenshot of your lock screen? I’ve been trying to do that but I can’t get it to work. I actually wrote a post about that not too long ago. You can check it out HERE. If you have the 5 icon dock installed, this looks dumb. I second that. Too bad … it’s a good concept, too. They need to make it customizable so that you may choose which apps and how many you want display. If they made it customizable and where able to put as many as you want on there then you would have an iphone just with out a lock screen. I disagree. I don’t want EVERY icon on the lock screen. I would just prefer removing the phone (b/c I tend to accidentally call people) and the Calendar (b/c I don’t use it often). I would like quick access to my emails and SMS from the lock screen without having to go through the unlocking portion. I also wouldn’t mind having access to the iPod on the lock screen. I installed this, and got into Safe Mode, installed it again, got another Safe Mode.. Is it because I have 5 Icon Dock installed? i installed it fine with 5 icon dock but on the lock screen is shifted to the left of the dock so the ability to add another app to the dock would be useful and the ability to change the order and dock icons is a must. what happens on an ipod touch? glad everyone else is annoyed at how bad this app looks if you have the 5 icon dock installed. I didn’t think I had OCD until now haha. Haha…sorry guys I don’t have a five icon dock so I didn’t know that it looked terrible! Thanks for the info. What about security? Is these mean any one who have access to your phone can check your email, phone contact, SMS and calendar? This doesnet work in conjunction with Intelli Screen. you cannot select anything on screen after clicking on an icon. A little off topic, but where did you get the battery in the lock screen shot? 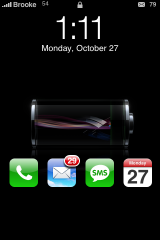 That is the Vista battery…check out THIS post. I mean, this is good but not practical for ipod touch users. It keeps crashing on me. I had it installed and now my lockscreen hang. Yes I have 5icon installed. Tried to reset (home+power button) but when reaching the lock screen, it happen again. Any suggestion how to bypass it (and uninstall)? Thanks. Hi there, just wanted to let you know that LockDockBar is not working on 3.0 on a 2G iPhone and forces springboard into safe mode. You probably know that already, just wanted to make sure, since I miss it badly !! 1) I found a bug: If I get called or calling sombody and hang up afterwards and press home — I am in my iphone, without entering my pin. This app lockdockbar does not work on 3.0.1 b/c it keeps crashing back to springboarb. Anybody know when this will be available to sue with iPhone 3.x? Thanks.